New Year's eve party or a Mardis Gras suit? Click on image for details and sizing. Orange available in 100% cotton or 65/35 poly cotton. Black Jumpsuits in 65/35 poly cotton poplin. Safety stitched seams for durability. Short sleeve only. No pockets. Snap front. Standard inseam length 32 ". Please note that when ordering multiple sizes shades may vary from one dye lot to another. We reserve the right to fill your order in either fabric content based on fabric availability. 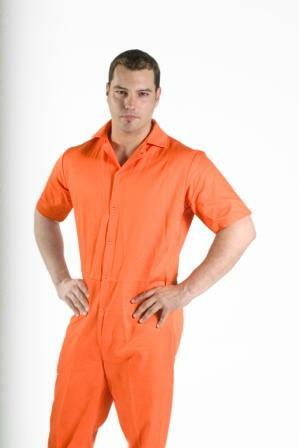 Finally an economical American made inmate coverall.